Spring Tax Detox – 2019! 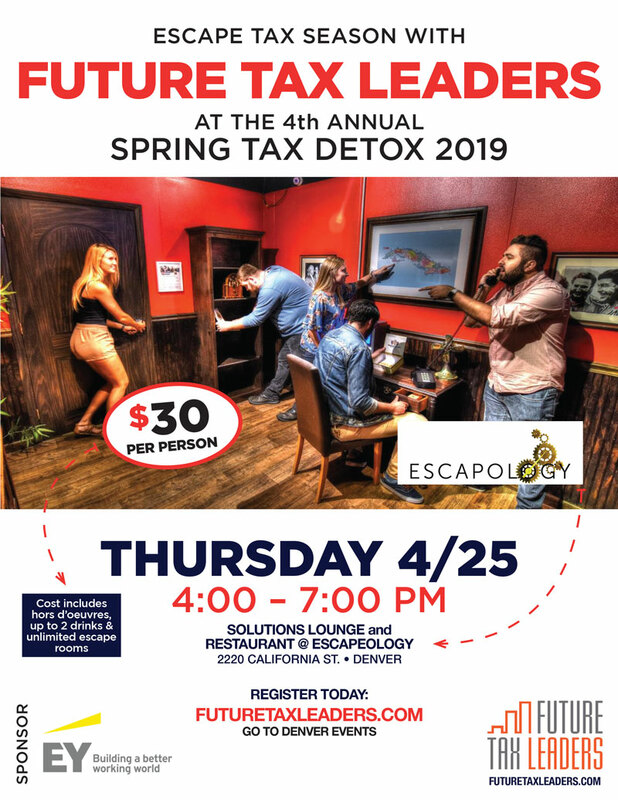 Time to register for the Future Tax Leaders’ annual Spring Tax Detox! This is always a don’t-miss event for Tax Pros, Accountants, Attorneys, EA’s and other professionals in the Denver area. FTL is all about fun and this evening will not disappoint. Come have some gourmet appetizers and tantalizing drinks in the lounge and then enjoy an escape room of your choice. Have a bit more time? How about try TWO escape rooms during the party? And… don’t forget to thank any of the professionals from EY in attendance for sponsoring this event. We love our sponsors! *Current FTL-Denver Members and up to two guests. Learn more about becoming a member at https://futuretaxleaders.com/about/how-to-participate/membership. *Strategic Partners, Detox sponsors, and their guests. The only Denver escape room with a full bar. Select from seven themed live escape rooms and enjoy gourmet food at the restaurant, Solutions.